Meghan has brought an 11-strong entourage with her as she joins Prince Harry on a two-day tour of Dublin. 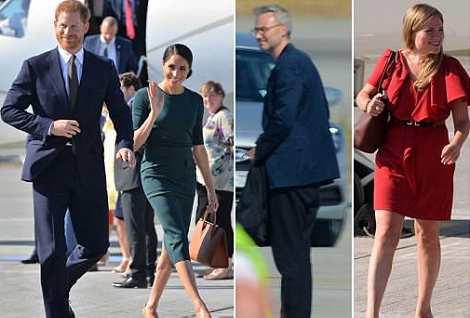 Her team includes celebrity hairdresser George Northwood, her own assistant private secretary Amy Pickerill, and a PA.
Harry's long-standing private secretary Ed Lane Fox and Sir David Manning, the couple's advisor on foreign issues, are also accompanying the Duke and Duchess of Sussex on the trip. Completing the entourage are a four-strong press team, including their own social media press officer, as well as a programme co-ordinator and an aide. Members of the couple's team were seen touching down in Dublin with them, at the start of their first official tour outside of the UK.